CAIRO -- A reporter for Al-Jazeera English was released from an Egyptian prison and deported Sunday after more than a year behind bars, but his two Egyptian colleagues remained jailed in a case widely condemned as a sham by human-rights groups. Australian Peter Greste was whisked away on a flight to Cyprus. His release came as a welcome surprise to fellow reporters and activists who spent months pressing for his freedom. But rights groups and Greste's Qatar-based broadcaster called on Egypt to release the other two defendants in the case, which has hindered the country's international standing as it struggles to recover from the political unrest and economic collapse caused by the 2011 uprising. Greste, Egyptian-Canadian Mohammed Fahmy and Egyptian Baher Mohammed were arrested in December 2013 over their coverage of the violent crackdown on Islamist protests following the military overthrow of President Mohammed Morsi. Egyptian authorities accused them of providing a platform for Morsi's Muslim Brotherhood, now declared a terrorist organization. But authorities provided no concrete evidence. The journalists and their supporters insist they were doing their jobs during a time of violent upheaval. The three were widely seen as having been caught up in a regional power struggle between Egypt and Qatar, which funds Al-Jazeera and had been a strong backer of Morsi. Greste's release follows a thawing of ties between Cairo and Doha. 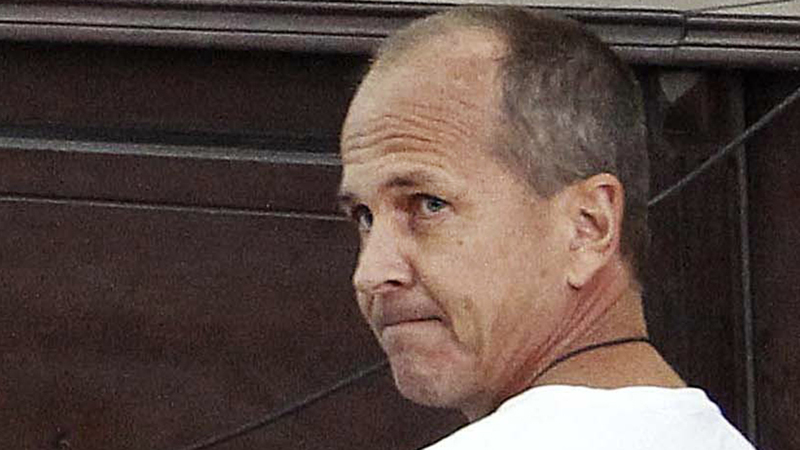 "Hard to believe but YES PeterGreste is a free man," his brother Andrew wrote on Twitter. Australian Foreign Minister Julie Bishop, who had been negotiating for Greste's release, said Monday that the 49-year-old journalist had told her by telephone from Egypt that he was desperate to return to his family in the Australian city of Brisbane after spending 400 days in custody. "He was immensely relieved and he was desperate to come home to Australia and reunite with his family," Bishop told reporters in Sydney. "From my discussion with him, he was very keen to be back on a beach and lying in the sun in Australia," she said. Greste had been given short notice that he was being released "unconditionally," Bishop said. "We moved as fast as we could to make arrangements for his immediate departure," she said. An Egyptian prison official and the nation's official news agency said Greste was released following a presidential "approval." The official and an Interior Ministry statement said he was released under a new deportation law passed last year. The law appeared to have been tailored to the Al-Jazeera case. The officials spoke on condition of anonymity because they were not authorized to speak to the media. There was no word on the fate of the other two defendants. Acting Al-Jazeera Director General Mostefa Souag said the Qatar-based network "will not rest until Baher and Mohamed also regain their freedom." "It is vital that in the celebratory fanfare surrounding his deportation the world does not forget the continuing ordeal" of his co-workers. Canada also welcomed the "positive developments," saying it was hopeful that Fahmy's case would be "resolved shortly," according to a statement from the office of the Minister of State for Foreign Affairs and Consular. Mohammed received an additional three years for his possession of a spent bullet he had picked up as a souvenir. Three other foreign reporters received 10-year sentences in absentia. Twelve other co-defendants were sentenced to between seven and 10 years, some of them in absentia. The Al-Jazeera journalists' arrest was part of a broad crackdown against Islamists in which hundreds have been killed and thousands arrested following the ouster of Morsi. Many of the leading activists behind the 2011 uprising that brought down President Hosni Mubarak have also been jailed for violating a law banning unauthorized protests. According to a law passed late last year, Egyptian President Abdel-Fattah el-Sissi - who as military chief overthrew Morsi amid popular protests against the Islamist leader's yearlong rule - has the power to deport foreign defendants or convicts if it's considered to be in the interest of national security. The law was seen as providing a potential legal instrument with which to free the journalists. Greste, 49, had only been in Egypt for a few weeks when he was detained. Fahmy had taken up his post as an acting bureau chief only a couple of months before his arrest. After freelancing in Britain, Greste joined the BBC as its Afghanistan correspondent in 1995. The following year, he covered Yugoslavia for Reuters before returning to the BBC. He spent more than a decade with the British broadcaster, reporting from across Latin America, the Middle East and Africa before joining Al-Jazeera in 2011 - the year he won a prestigious Peabody Award for a BBC report on Somalia. Greste's hometown is Brisbane, Australia, but he now lives in Nairobi. Fahmy, 40, has reported for CNN and the New York Times. He had to put off his marriage plans because of the trial. Mohammed's wife gave birth to a child while he was in prison. He will not benefit from the deportation law because he does not have another nationality. His wife, Jehane, said she couldn't imagine that his colleagues would be set free while he languishes in jail. "They should all be set free. It is the same case," she told The Associated Press. "Or is this about foreigners and Egyptians?"